​The Chinese have a saying - ‘May you live in interesting times’. It’s not meant as a blessing so much as a world-weary curse. There are plenty of ‘interesting’ cultural and political currents going on right now - and Gaëlle Mourre’s sumptuous short film, The Feast, picks up on quite a few. Based on a dystopian fairy tale by L. P. Lee, the story showcases the talents of Harry Potter star, Katie Leung, who plays an aspiring working class artist, hoping to forward her and her friends careers by accepting an invitation to a rich man’s home that turns out to be 50 Shades of Shady. Without giving too much away, the score, cinematography and art direction at times share an allusion to classical paintings reminiscent of Kubrick’s Barry Lyndon and Greenaway’s The Cook, The Thief, His Wife and Her Lover. Leung’s character Hayley finds herself in that all-too-familiar Faustian bargain of the powerless, where to achieve the agency over her own destiny not afforded her by birthright, class, gender, colour sexuality etc., she has to risk losing something of her sense of self, agency or dignity. 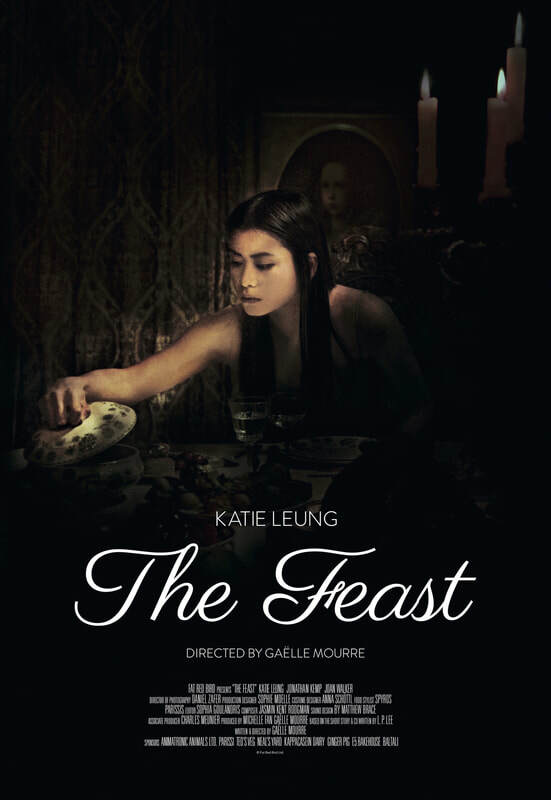 The Feast literally makes an eye-popping, mouth-watering meal of this metaphor - it’s quite remarkable to watch, evoking all sorts of conflicting emotions. (Full marks to Leung for getting stuck in to the part). You’ve worked together before? Was that how you first met? Michelle - I met Gaelle through the film’s co-writer, L.P. Lee. We all worked on another short film together, called House of Locks - a snappy horror piece. Then we embarked on The Feast. Gaëlle - We met through L.P. with whom I co-wrote House of Locks (also based on a short story she had written), our first film collaboration. This served as an introduction for us, to figure out how our dynamic could work on a bigger project, which led to our collaboration on The Feast. How was The Feast funded? Michelle - The Feast was made possible by a mix of private investors, including our generous friends and family. We’re also super grateful for the warm, sparky food entrepreneurs (and taxidermists) who helped make our film look magnificent - we felt welcomed by the food community in London and I will forever appreciate that. Gaëlle - The Feast was a labour of love in many ways. We funded the film through personal savings, and the contributions of friends and family, many of whom had previously supported my graduation short film Awakening. I worked in television for a couple of years and used my savings from that job to fund a chunk of The Feast’s budget. How much did the current conversation around sexual harassment and #metoo movement influence the film? Michelle - The film was conceived and developed before the Weinstein scandal (and a bajillion others) came to light, but the reality of living as a young woman (of colour) and having to navigate the insidious structural forces that entrap you - this was something that resonated deeply with us all. Ask any young woman and they’ll tell you about a time (or several) when they felt violated or preyed upon by men acting out patriarchal norms. So the underlying feeling and thinking behind #metoo definitely helped fuel this film. We’re thrilled that The Feast can now contribute to that discussion - it’s important because systems of oppression exist structurally, and are often unseen. This film makes the theft of (female) dignity visible. Gaëlle - We actually locked production on The Feast before the #metoo movement broke out. However, what pushed the #metoo movement was already brewing, and it’s something that many of us felt. #metoo was like coming up for air, and before that, we were swimming towards the surface. It was important to me to make a film that could serve as a visual metaphor for what many people experience regularly. The film has left many a viewer feeling disturbed, and whilst that’s an unpleasant feeling, it opens up a dialogue about how people can feel when someone in a position of power exerts that power over them. Many people can relate to that. One of the great things about #metoo, aside from ensuring those who have been affected are heard and taken seriously, is to also show how many people this has touched, and to emphasise the importance of accountability. And this opens up people’s minds and makes them more receptive. The Feast isn’t a niche film for the happy few; it’s a topical tale about our lives right now. Could you see yourselves developing this story into a full length feature? Gaëlle - I have often been asked about what comes next in the story. People want to know that The Count will get his comeuppance, and they want to know what will happen to Hayley. Where will she go from here and what will she do, what becomes of Hayley? Whilst there are no concrete plans to develop this into a feature length film, I am definitely open to the idea. Perhaps we will wait to see what happens in the world and see if we align Hayley’s future with our reality once again? Or perhaps we should just write it and take that into our own hands. Michelle - Yes! I would absolutely love to. There is so much richness in Hayley’s and the Count’s worlds, and to bring that to life would add even more vibrancy to the story. It’d be great to really build a ‘dystopian’ world and see what that means to us today. Where can people catch The Feast next? Michelle - We’ve just officially started the film’s festival run - keep in touch with us at www.thefeastfilm.com for screening details! Without giving too much away, would you say the women in the original story and the film experience different emotions at the end? Gaëlle - The two women essentially come from different worlds that are plagued by a similar source of oppression. In that sense, it’s a bit tricky to compare the two. In the short story, we leave the woman as she is led back home – the story ends very quickly after the feast. Gaëlle - Indeed, the setting in the film is very different to the setting in the story, and there are a number of elements that exist in the film that aren’t in the story, and vice versa. Both the film and the short story centre on a uniting theme, as you say, but in order to have a similar impact on the audience, they have to convey these themes differently. When I read a text, I always pause and go at my own pace, visualising what comes to me through the pages. In a film, the pace is set for you, and the visuals are already determined, so as a filmmaker I had to find different ways of getting the viewer to project and invest in the story. Because of this, we brought The Feast closer to home, in a world visually familiar to us but also slightly “other”. Anna, the Costume Designer, and Mimi, the Costume Constructor, were key in this regard. They created beautiful costumes with a twist, supporting the desire I had to create a world with its own visual mechanics. This is one example of how we conveyed the fact that we were in a dystopian world without having to explain it through text or dialogue. Bringing The Feast close to home also gave me the opportunity to explore a particularly topical story. ​How did the cast come on board? Gaëlle - Thanks to the amazing casting skills of Stanley Timberlake who put me in touch with every member of the cast. S had put me in touch with Katie over a year before we went into production and we then took the conversation over to her agents. We aligned our shoot dates to work around Katie’s schedule because the role of Hayley was re-written for Katie. In my mind, no one else could play her, it had to be Katie, so I’m so glad it worked out. I’d also already worked with Joan (The Attendant) on Awakening and originally the role of The Attendant was meant for a man. But then Stanley suggested Joan and I knew that she would be right for the role. We’d also originally auditioned Jonathan for the role of The Attendant but then found that he was actually The Count, especially with his amazing voice. He just got the vibe of the story and brought the character to life. Kieran and Anthony were auditioned together and had a great dynamic; they brought interesting details and energy to the scene, which wasn’t easy. Because they play in such a short scene, it’s difficult to convey much in a short amount of time, but they played super well off of each other as well as with Katie. How did you find your perfect ‘House of Plenty’ to shoot the meal in? Gaëlle - A lot of research, and a fair amount of luck, went into finding the right location! I couldn’t compromise on the look of the house but we were also constrained by a tight budget, so it had to be in London. I happened to be browsing online and found Southside House on an online gallery of photos that had popped up on my Facebook feed. I then emailed them, and to be honest, I was expecting to be turned down. But they were so lovely and willing to help, it was perfect. Overall, we encountered so many people willing to chip in and help with The Feast, it really united many people and organisations into one common project. I think this was partly due to the subject of the film, and perhaps also because we are still making our way in the industry – many of the people we worked with remember what it’s like to start out. Gaëlle - There was a lot of food on the table! Spyros, our head stylist and chef, was an absolute legend. We worked closely on the menu and set up and he just ran with it and came up with so many brilliant ideas and solutions. Katie had to eat a lot of the food, and there was a fair amount of waste as the idea in the film is that Hayley never finishes one thing, she’s too eager to consume everything. It was a true testament to Katie’s professionalism that she managed to do quite a few takes with the same verve. So there was a good amount of food that got half eaten and then chucked away, and there were also meats that were no longer safe for consumption after being out all day and under the lights... but we also always knew that we would recycle whatever we could. So the cakes, veggies, cheeses, fruits, breads and even some meats which we managed to refrigerate as they weren’t always needed in shot, were served up on our snack table once the feast scene was done. In fact, there was so much cheese that we ended up finishing it off at our wrap party. I’m so glad we could eat the leftover food, not only to minimise waste, but also because it was so delicious. Our sponsors really spoiled us and Spyros’ food was unreal. A fair few stomachs were rumbling when we were filming the feast scene, mine included! This isn’t your first short film. What advice do you have for aspiring filmmakers starting out on their first short feature? - Build a community with whom you enjoy making films. This is, in my opinion, one of the reasons why it’s difficult to pierce through in the industry, because everyone sticks with whom they know. But it’s a smart approach: making films is tricky enough as it is, so if you make sure you’ve got at least one or two key cast or crew members with whom you like to collaborate, you’re ensuring you have a solid and functional base with which you know you can create something good. - Similarly, try to build a support network around your projects. They can be friends, family, colleagues... people who will cheer you on when the going gets tough and encourage you to go through with your ideas. They may even help with financing or by chipping in however they can. And be a cheerleader for others’ projects too, we all need to help each other out however we can. - Don’t be afraid to make mistakes. However; if you’re just starting out and haven’t made films before, keep them a little under the radar. What I mean is, involve those closest to you but be realistic about whether or not you’re ready to reach out to people a little further out in your network. It’s important to make mistakes but it’s also important to be wise about resources, so make sure you involve people when it makes sense. I’m still figuring out a lot of this, and working my way towards feature length content, so it’s a constant learning curve! I’ll leave off with a final piece of advice: always take stock of where you are and where you are going, it’s very easy to let time slip by and suddenly realise you’ve wasted precious time you could have been spending on a project you love. Many people will tell you that you have time, especially if you’re young, but there’s never a better time to start than now (trite, but true).